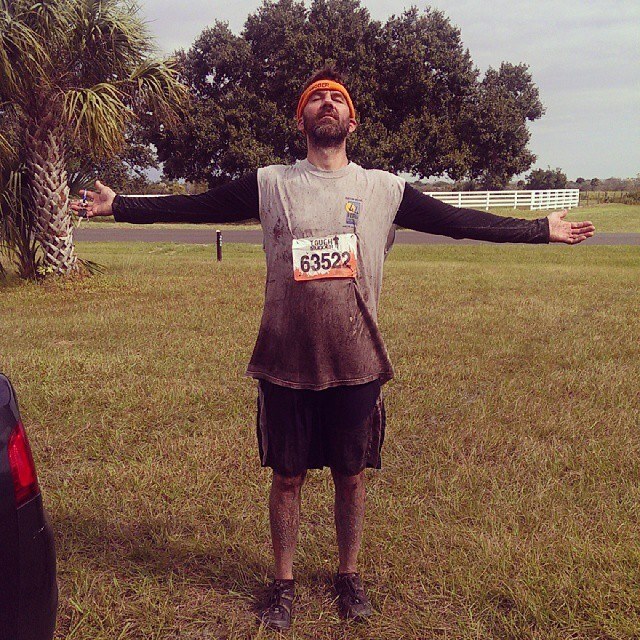 After the second Tough Mudder of 2013, this time with my son. As of this writing I am 46 years old. I work at Bank of America as a engineer of unified communications applications, but I am pursuing a graduate degree in practical philosophy and applied ethics at the University of North Florida. Husband to one, father to two. My greatest joys can be found on my paddle board and hiking any mountain trail with family, friends or my dog. I have never been published, though when I wrote for the Jacksonville Jaguars fan blog Big Cat Country a few of my articles were referenced by ESPN and CBS Sports AFC South bloggers. How I have managed to achieve any degree success in life is a testament to being in the right place in the right time. I rarely operate on a budget, and most of my goals were decisions made without detailed thinking. As much as I have tried to be “strong and independent” this truth has made itself known: life is better shared.